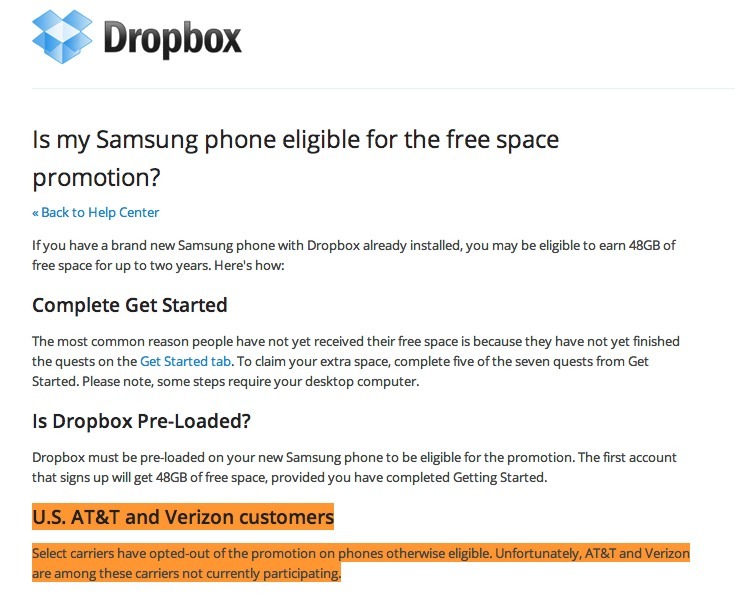 When Samsung announced the Galaxy SIII in London, they mentioned that the phone would come with 50GB of free Dropbox storage for 2 years, adding to its appeal. When announced stateside though, there wasn’t a mention of the promo from any of the carriers, but we just assumed that it was still a go. And then today, a Dropbox moderator mentioned specifically to a member of their forums that AT&T and Verizon had opted out of the deal. The member was asking for help because they were not seeing the free storage appear after purchasing the phone, yet did not specify the version, and that’s when this moderator chimed in with the opting out stuff. Update: According to an official Dropbox support page, this is indeed true – Verizon and AT&T have opted out of the 50GB promo. Not sure how that affects your decision to purchase this phone, but do understand that after 2 years, we weren’t even sure what was going to happen to that storage. This isn’t a free 50GB of storage for life type of thing, unless Dropbox decides later on that it should be. It was like a 2-year test drive. It would have been a nice add-on, but there are so many cloud storage services out there at this point, that you should be able to survive. We still have word in to VZW, Dropbox, and Samsung, so if we hear something different, we’ll be sure to pass it on.